I’ve been dragging lately. I was feeling tired for weeks and got sick pretty early in the season, so I have been trying to up my immune system to prevent that from reoccurring all winter long. 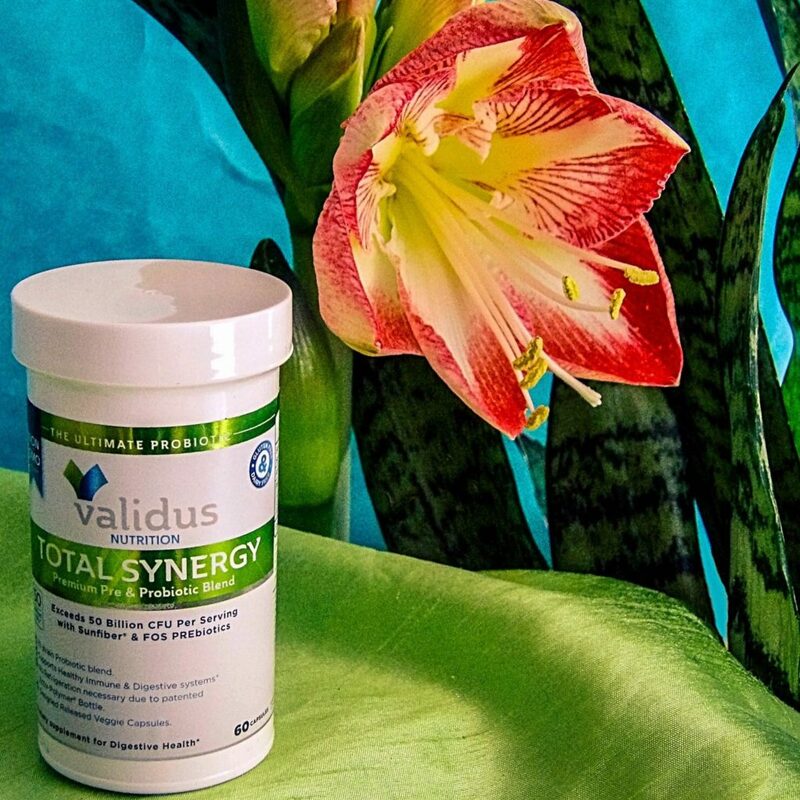 So I am quite happy to have found Validus Nutrition Total Synergy Premium Pre and Probiotic Blend. We tend to think of PreBiotics and Probiotics as purely for stomach health, but actually, it goes so far beyond that. Your immune system as a whole is largely based in your gut. Personally, I think of white cells in the bloodstream when I think of the immune system, but according to Validus Nutrition (and confirmed by research I did on the NIH website), 80% of the immune system is in your gut, so for optimal health, well-being, and appearance, it pays for your gut to be healthy! That is why it is so important to have a good Pre and Probiotic Blend like Validus Nutrition Total Synergy Premium Pre and Probiotic Blend. 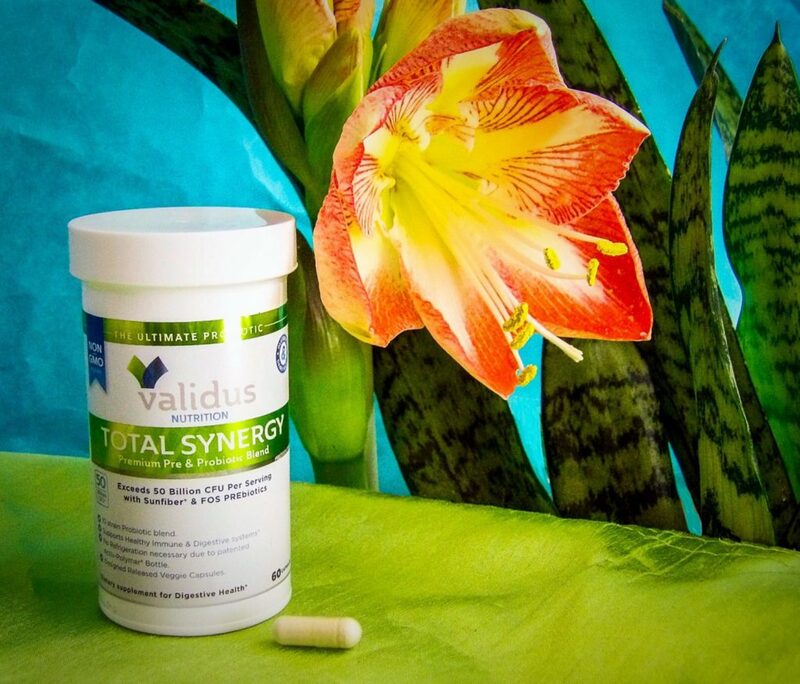 Validus Nutrition Total Synergy Premium Pre and Probiotic Blend contains ten strains of Probiotics. Since many Probiotic formulas only contain a few strains, having ten strains puts this formula ahead of most of the brands you will find at the drugstore. It also contains over 50 Billion CFUs of the ten Probiotics, which is an optimal level. For as much as we hear about Probiotics, we don’t hear a lot about Prebiotics. So what are Prebiotics? I like Validus Nutrition’s explanation: they are the food for the Probiotics. As you know, Probiotics are bacteria. Good bacteria, but bacteria nonetheless. Bacteria needs to eat. Give it good food in the form of Prebiotics so that the Probiotics can do their job! So it is optimal to have a formula that contains both Prebiotics and Probiotics. This formula contains two well-known high-grade Prebiotics. Validus Nutrition’s blend is easy to integrate into your routine. One capsule in the morning before food and you are done. I keep the bottle by my bed and have it with my morning glass of water. I often forget to take certain supplements on time, but having it right there when I get up makes it easy to remember. I’ve noticed I have more energy since I started these and my skin has a bit of a glow. It makes sense that when your immune system is operating better that you will have more energy and your skin reflects the general state of your health, so I’m thrilled to have found this formula! The bottle is a sixty day supply, and unlike some Pre and Probiotic formulas, does not need to be stored in the refrigerator thanks to a specially crafted bottle. It is also vegetarian-friendly, gluten-free, lactose-free, dairy free, Kosher, and doesn’t have artificial flavors or preservatives. The company also offers a full refund if you find that it doesn’t work for you, so it is definitely worth a try!